Download syslinux. The file that you need is syslinux.exe. It is located in the "win32" folder of the ZIP archive you downloaded. 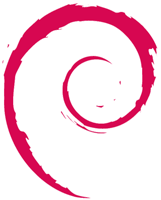 Download a Debian installer, e.g. the current installer for Lenny. Download a "netinst" ISO image for Debian, e.g. the most current image. Format your USB flash drive, using FAT16, if possible. Use NTRawrite to write boot.img to the USB flash drive. Just launch NTRawrite.exe, enter "boot.img" and the drive letter of the USB flash drive. This step can be quite slow. Use syslinux to make the USB flash drive bootable. Just launch syslinux.exe with "-f e:" as argument (replace "e" by the drive letter of the USB flash drive). "Safely remove" the USB flash drive and put it back (I'm not sure this step is mandatory/useful). Copy the ISO image to the USB flash drive. "Safely remove" the USB flash drive again. Voilà. It is ready. If, for a reason or another, you don't manage to boot on your USB flash drive, try formatting it using HP USB Disk Storage Format Tool. It might help.